I am not what people would refer to the “strong, silent type.” Yet for seven days from June 25 – to July 1 I participated in a silent retreat conducted by the Jesuit Center in Wernersville, PA. Last fall I volunteered to be part of a study being conducted by Dr. Andrew Newberg of Jefferson Hospital in Philadelphia who is doing research on the relationship between spiritual practices and brain function. Dr. Newberg paid for my retreat in exchange for having my brain scanned (some would say “having my head examined”) before and after the experience. While the brain scans were an experience in themselves that required a fair amount of spiritual fortitude (I am thankful for having learned “yoga breathing”), the experience of living in silence for a week together with 30 other people was also informative and at times stressful.I also committed myself to be “off the grid” in the sense that I did not read or send emails, so I was not communicating with folks off campus either. 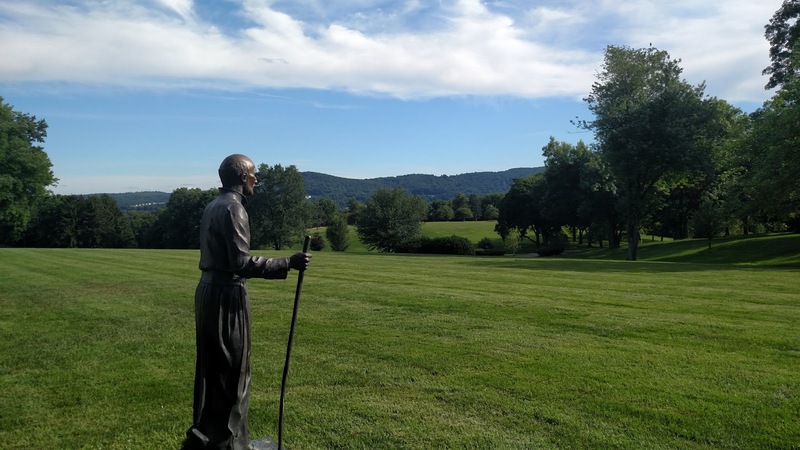 The retreat was “directed” which meant that we were being led through a series of “spiritual exercises” developed by Ignatius, the founder of the Jesuit Order, designed to develop and deepen one’s spiritual life. The full slate of Ignatian Exercises takes 30+ days, so we were given sort of an “Ignatian sampler” of various ways of praying, reading the Bible, and thinking about ourselves in relationship to God. I had never done anything like this, and yet I found that many of the exercises I was asked to do were similar to ways I had learned to pray or read the Bible in other settings. So though the overall feel of the Center and the retreat was very Roman Catholic (which I am very not), there were several points of connection to my own attempts at practicing and living out spiritual disciplines. One thing about Ignatius I found particularly helpful is that he thought of himself as a “contemplative in action,” and so instead of inviting one to withdraw from the world, he invites people to engage the world in and through one’s spiritual practice; I resonated deeply with that approach. Now some people might relish the idea of being in a situation where you don’t have to talk to anybody as nothing short of wonderful. While at first I was relieved to not have to make the kind of small talk that usually happens at the beginning of a workshop or a conference, after about a day the silence started to get to me. I wanted to ask people questions, see what they were reading, and generally make the small talk 24 hours earlier I was relieved not to have to do. I should note that each morning I met with a spiritual director named Bruce with whom I could talk, and I expressed this frustration with him. Bruce just listened to my concerns, smiled and then gave me the exercises I was to do that day and I was sent into another 23 hours of silence on my own. By day three, I was feeling bored, and by day four I wondered if I should just call it quits. I did not sleep well, and I was in constant motion, trying to keep myself busy, and frankly not feeling all that spiritual. Because I did not know anyone, I began giving them names in my mind. “Birdman” was a guy who before we went into silence shared that he experienced God in the singing of the birds; “Glider” was a woman who seemed just glide as she walked; “Coach” was a husky, short haired woman with a prosthetic leg, but who looked like she had been quite an athlete in her day; “Blindman” was in fact a blind guy; and “Distinguished” was a debonair gray-haired guy who always read a book at meals, and wore a shirt from a different university every day. Heaven knows, what names they gave me with Gandhi t- shirt, and my bright orange bike jersey. Through it all, I realized that for me so much of my spirituality is tied to my relationships to and interaction with other people. While at different times in my life, I have tried meditation, centering prayer, lectio divina and other forms of inward-focus spiritual disciplines (I even was “a charismatic” for a while in the 1980’s), I have always come back to the fact that God seems most present to me in the midst of activities directed at working for social justice with other people engaged in those activities. For instance, when asked by Bruce to share some of my “peak” spiritual experiences, I told him about my arrest as part of civil disobedience action in 2009, and my participation in the 2010 U.S. Social Forum in Detroit; not exactly what I think he expected. Ironically and coincidentally, while I was on retreat, the world and the nation experienced some ground-breaking and tragic events. The Supreme Court Decisions on gay marriage and supporting the Affordable Care Act, the bombings in Tunisia, France and Kuwait, Pres. Obama’s “Amazing Grace” eulogy at Rev. Clementa Pinckney’s funeral, and the burning of several African American churches, all occurred the week I was on retreat. I read of these events and found my heart both broken and inspired, sometimes simultaneously. However, even more than these concerns, my heart, mind and prayer was focused on the debate taking place in the Pennsylvania capitol over the state budget and funds to be allocated for public education funding, an issue and an effort I have been deeply involved with. I will say more about this particular aspect of my retreat in subsequent blog, but the deep need to pray for a broken and hurting world impressed itself upon me. In the end I got used to the silence in that it allowed and forced me to pay attention to the world inside and around me. I don’t know if the silence itself was the means to this awareness, but simply being in a place where one’s every need is provided in a comfortable and safe manner, allowed me to focus in a way that is often not possible in my day-to-day life. So when I finally drove home last Wednesday night, I did not turn on the radio or listen to anything except the wheels of my car on the road. As I got closer to home, I was not sure what to say, but when I arrived, and as Cynthia and I talked, words slowly came. Yet even these few days later, there is within in me a place of calm silence that still seeks to pay attention, to listen, to empathize and to be present in a way I think would make Ignatius proud.